A project Lexington Mayor Jim Gray has envisioned for nearly seven years began taking form Monday morning, as ground was officially broken on what will become Town Branch Commons. Town Branch Commons will link Town Branch Trail and Legacy Trail to create 22 miles of uninterrupted bike and pedestrian paths, connecting downtown to the rural landscape. Work will begin in a few weeks on underground sewers in the area. Town Branch Commons is scheduled to be complete by 2021. 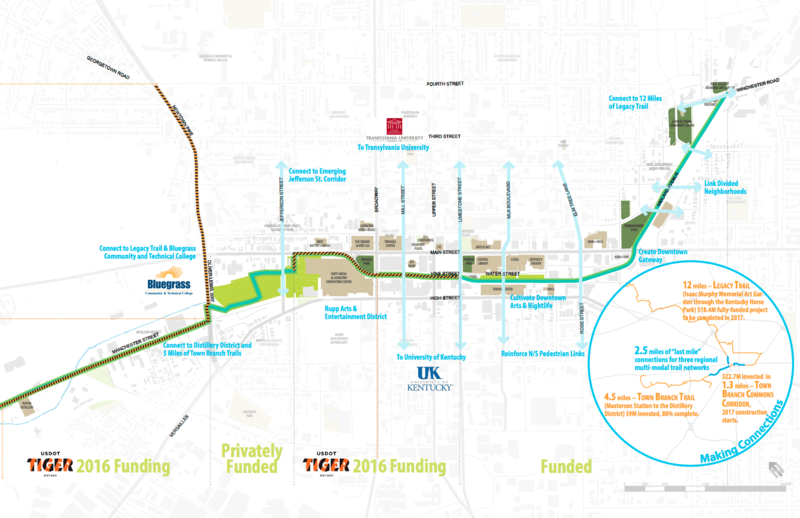 The path of Town Branch Commons will start near Rupp Arena, then continue down Vine Street to Midland Avenue before stopping at Third Street, the trailhead for the Legacy Trail. Gray, along with U.S. Rep Andy Barr and project developers, raved Monday about how Town Branch Commons will revitalize the city and create economic opportunity. Gray said the project will be worth the wait. “Great projects take time and imagination and relentless determination,” Gray said. Mayor Jim Gray, Congressman Andy Barr and others, tossed dirt during a groundbreaking ceremony for Town Branch Commons held Monday morning in Charles Young Park. Town Branch Commons will be a strip of Bluegrass running through downtown Lexington. This winding park and trail system will roughly follow the path of Town Branch, Lexington’s first water source, which is located in a culvert under modern-day Vine Street. Barr helped secure $14 million in federal funding through the TIGER (Transportation Investment Generating Economic Recovery) grant program. Barr said seeds of the project began long before 2012, when he and Commerce Lexington President Bob Quick went on trips to Greenville, South Carolina, Austin, Texas and Oklahoma City and discovered how their downtowns all had something that attracted people, young workers, entrepreneurs and led to economic activity. Town Branch Park Advisory Board Chair Ann Bakhaus high-fived Congressman Andy Barr during a groundbreaking ceremony for Town Branch Commons held Monday morning in Charles Young Park. Town Branch Commons will be a strip of Bluegrass running through downtown Lexington. This winding park and trail system will roughly follow the path of Town Branch, Lexington’s first water source, which is located in a culvert under modern-day Vine Street. “We took a lesson from those communities and said we need something like this … an attraction, a green space, a park, a water focus… something that could attract more economic activity,” Barr said. A new three-minute flyover video of the proposed Town Branch Park gives people an idea of what the 10-acre park will look like. In addition to the TIGER Grant, the city has received $13.6 million in state and federal grants and loans and $6 million in private gifts. With a local investment of $11.8 million, the $39.5 million trail portion is fully funded. The proposed cost of Town Branch Commons was $35.5 million. But before Town Branch Commons begins taking shape, a sanitary sewer replacement project at Main Street and Midland Avenue will take around nine months to complete. The sewer project was originally slated to be done in 2023, but it was moved up to accommodate plans for the Commons. Gray said Town Branch Commons will define the city and will be a signature of downtown. This entry was posted in News on July 23, 2018 by info. 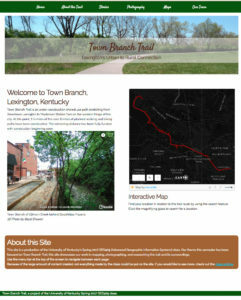 During the spring 2017 semester at the University of Kentucky, a group of 18 students in GEO 409 (Advanced Topics in GIS) created a website of maps for Town Branch Trail. The students focused on a completed alignment for the trail, which has been funded and partially completed during class. Students participated with a full spectrum of map-making and publishing; they GPS mapped and photographed points of interest, created topographic maps of the trail corridor, and made detailed, interactive maps using 3d data for building structures. Students participated a full spectrum of map-making and publishing; they GPS mapped and photographed points of interest, created topographic maps of the trail corridor, and made detailed, interactive maps using 3d data for building structures. They used GitHub to share their work and published a website for their research. Furthermore, they used mostly free and open source software and data. This entry was posted in News, Town Branch History, Trail Landmarks on June 1, 2017 by info. Lexington has received a $14.1 million federal grant that will pay for the Town Branch Trail from South Forbes Street to Midland and Third streets, city and federal officials announced Tuesday. The $14.1 million Transportation Investment Generating Economic Recovery, or TIGER, grant is a competitive grant for infrastructure projects offered through the U.S. Department of Transportation. The grant will be used to finish a section of the Town Branch Trail from South Forbes Road on Manchester Road through the Distillery District. The grant will also be used to pay for portions of a more than 2 1/2-mile section of the trail downtown from Oliver Lewis Way to to the Issac Murphy Memorial Art Garden on Third Street. The 2 1/2-mile section is called the Town Branch Commons, which is part of the overall Town Branch Trail. Other funding to build the commons includes nearly $7 million in state and federal transportation grants and $10 million in city bond money. Additionally, the city is pursuing a $5.6 million low-interest loan from the Kentucky Infrastructure Authority to pay for the trail and enhanced streetscape, such as plants and benches. Lexington Mayor Jim Gray, who pushed for the grant, said the $14.1 million will make the project — and the dream of connecting the Town Branch and Legacy trails — a reality. Gray praised U.S. Sen. Mitch McConnell for helping the city make its case with federal transportation officials. Gray also thanked U.S. Rep. Andy Barr, R-Lexington, and former Louisville Mayor Jerry Abramson, a staffer for President Barack Obama. Barr wrote several letters in support of the project. Dowell Hoskins Squire, Lexington’s environmental and public works commissioner, said the city recently released a bid for the design work for the 2 1/2-mile commons. A design firm will likely be selected sometime in late summer. Construction likely won’t begin until spring 2018. Squire said the city had asked for $15.9 million but received $14.1 million. That leaves a potential gap of $1.8 million. “The plan is for the mayor to request that $1.8 million in fiscal year 2018,” Squire said. The city has already set aside $10 million for the project. Van Meter Pettit, president of Town Branch Trail Inc., a nonprofit that spearheaded efforts to start the Town Branch Trail, said Tuesday that he was “thrilled to death” the city secured the federal funding. When completed, the Town Branch and Legacy trails will make commuting to downtown by bike much safer. This entry was posted in News on July 26, 2016 by info.